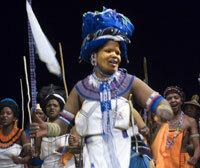 South Africa is a country rich in culture and diversity but its Africa Day awareness seems to be lagging behind. May 22 2013 (IPS) - As the continent prepares to celebrate the 50th anniversary of the founding of the Organisation of African Unity (OAU) on Africa Day, 25th of May, IPS Africa speaks to ordinary South Africans to hear how they plan to celebrate this important day. However the responses we received were rather disappointing. Africa Day is an annual commemoration of the historic 1963 meeting of leaders of 32 independent African states to form the OAU, now simply known as African Union (AU). I really like this especially the comment by the last guy. SA really does owe the OAU for its democracy.